Ocean Xingye Technology Corp. (B.J.) dates from Beijing Ocean Electromechanical New Technology Corporation’s Instruments sub-company in 27 December 1997， is a National High-tech Enterprise. 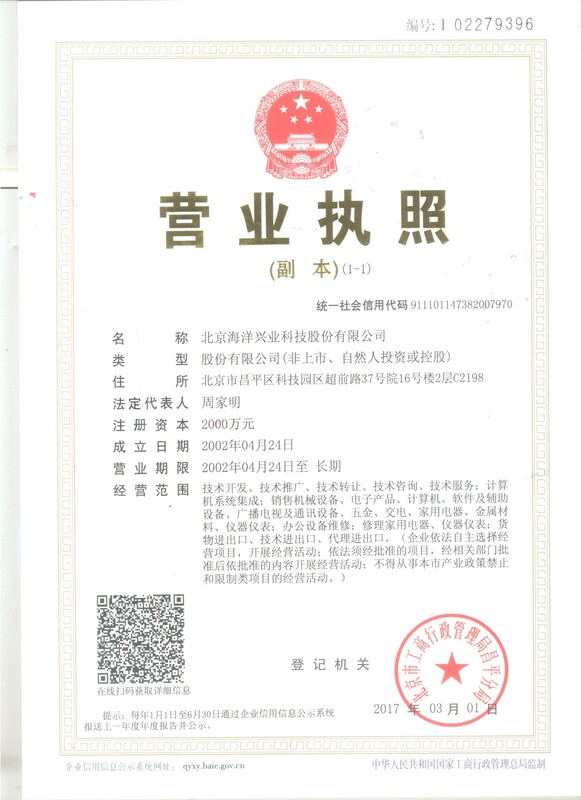 The company started its instruments business since 1984; imported overseas management system and partners since 2001; owned import & export right and received the reputation of A+ corporation awarded by People's Bank of China in 2013; Passed the ISO9001 quality management system certification in 2014; Set up Research and Development Department and received six national computer software copyrights certificates, one practical patent and passed the GJB9001B military standard quality management system certification in 2015. Ocean Instruments, committing to the electronic measurement & maintenance fields, whose objective is not larger but more powerful. Main products include: electronic measurement instruments, measurement-system integration and electronic welding & detaching tools, electronic instruments maintenance 4S service. The company’s objectives during the initial phase of establishment include: enhance the corporate system and training of staff, establish a comprehensive market service structure, strengthen the company’s ability in client training and client services. The medium term objectives of the company include: strengthen and expand cooperation with reputable suppliers both from China and abroad, strive to become their qualified and outstanding agent. Set up its own market research and development department, to develop and design matched integrated products, in order to increase its capacity in providing value-added services to clients. At the same time, through improving its own professional services capacity,we will add glamour to the company's brand name. Eventually: the company will become the most professional and outstanding supplier of electronic testing instrument and the maintenance of electronic products between domestic market and opening-up to the world. In Ocean Instrument, We devote in the field of T&M and product service! Referring to the electronic testing, it means to do direct deal and judgment on ration and quality with the concept of certain parameter, principal, index and so on. Electronic maintenance is based on electronic testing; by the testing results we amend and deal the electronic instruments to be perfect by means of necessary dealing tools. At the same time, with improvement and development of the modern scientific technology, the traditional method which depends on experience has been challenged; Instruments for testing require much more professional, advanced and comprehensive; Servicing technology requires much more complex, concrete, and difficult. For instance, In traditional maintenance for electronic instruments, joining and drawing are pretty common because of divided components and DIP, and it is easy to deal with by using common iron and simple solder. However, with the development of SMT, using traditional ironing and drawing to test CMOS chips, such as QFP, BGA, PLCC and so on, are not enough at all. In most of testing judgments, we can not solve some problems merely depend on one or two electronic testing parameter or experience. Direct comparison、 testing qualitative、test of parameter compound and so on, have occupied lead position. What’s more, it’s more and more difficult to catch up with the development of electronic instruments. For example, traditional oscilloscope is not only observing electrical signals, but also measuring kinds of parameters. And the displaying technology use higher frequency, processing technology is more digital, measuring technology is more automatic, testing technology is more diversified, multi-domain synchronous observing emerges. Ocean Instrument, which has more than twenty years’ professional operation in electronic TMI. Facing the new technical challenges above, we endeavor to find a way for service on electronic testing and maintenance field. First of all, facing the challenge from traditional testing instruments, we enhance to cooperate with advanced domestic and international business enterprises, giving the most advanced techniques to our customers; Strengthen the co-operation with Tektronix(USA),manage to popularize the most advanced products and testing techniques in the world, such as Oscilloscope,Logic analyzer, Arbitrary functional generator,High voltage & electric current testing solutions,and so on;At the same time, we are looking for excellent enterprises in china, and execute the policy which selling our instruments to the customers directly, thus we can give the benefits to our customers who support all the time. In the field of professional testing, according to the scope for ourselves, we adopt the method of co-operating with other business fellows: Cooperating with Ideal (US), we introduce all hand tools instruments to users, especially Ideal cable testing instruments.Strengthen the cooperation with Rohde & Schwarz (German), trying to providing perfect radio frequency testing and Electro-Magnetic Interference testing solution for basic electronics laboratory. Cooperating with Pomona (US) and CA (France), try to make every kind of fittings adapt to different environment for testing---especially the test for SMT. Nowadays, national companies’ products and technologies are becoming mature. Since 2002, Ocean Instruments (OI)selected the road of private brand. OI developed arbitrary waveform generator, oscilloscope test software, high-voltage probe, differential probe, desktop logic analyzer, multimeter and programmable power source with Intellectual property rights, by cooperating with Qsinghua University, Beijing Chemical Unviersity, BeijingJiaotong University. On this basis, OI established R&D Department and launched kinds of testing systems. We promote intelligent building testing instruments such as IDEAL cable testing instruments. We promote Weller (German) lead-free soldering and detinning tool replacing Japanese HAKKO tools. Secondly, synthesized experiences from the past, we perfect the difficulties in testing maintenance from our customers, and endeavor to fix the obstacles without experiences by exploited ourselves. By using ASA principle, we recommend the testing method to our customers. In this way, it can lower their strength and difficulty on work. And in the other hand, we also enhance the ability of technical exploitation and training inside our company, manufacture and exploit the matched products for increment, such as Oscilloscope probe,High voltage probe,detector, Difference probe, Testing software,TR210A ASA measurement,Function generator、5 4/5 digits multimetor、Lead-free soldering and SMD rework station,logic Analyzer,Line power supply,and so on. R&D department which found in 2015 has already get five software copyright and one utility model patent, developed power supply testing system, electro-magnetic interference testing system, field pressure calibrator, motor bench testing system and so on. At the same time, Ocean Instruments increase the intensity of the service, provide full range product training, strengthen website building, trying to make the website a professional electronic testing and maintenance website. On 2010, we launched multimeter mobile website and Ocean Instruments WeChat public platform. Absorbing national and international advanced technique, we will try to publish more excellent articles, improve company internal professional journal “Ocean Electronic Instruments News” and electronic instruments data. Hard work returns good pay. Through the cooperation and support from Tektronix and Rohde&Schwarz, we have established perfect college project for electric experiment programming in the north China, interaction with college teachers, establishing graduate internship system, by staff’s knowledge and experience, we trying to establish 3C certificated electrical parameters and EMI testing system. With the challenge of lead-free soldering, we provide lead-free soldering solution with Weller Smoke Air Purifiers. By promoting frequency-domain testing instruments, we established EMI testing solution. Cooperating with Taiwan Prodigit and Chroma, we provide more power supply, electrical load and power supply testing solution. Cooperating with ZLG, we provide power analyzer and electrical energy quality testing solution. Future is the era of information explosion. Traditional business mode has been challenged by the development of network and on-line trade. Ocean Instruments has invested to established the first connector and cable electronic business platform “cable shopping website: www.gooxian.com”to promote the development of Internet plus. While there is emotion and strength, there is prospective future!